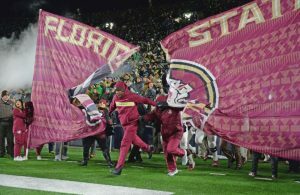 After dropping 13 of 19 games, Florida State has quietly shown signs of life of late and a big reason for that is a couple of young arms. Entering the season, the pitching staff at large was a question mark. The Seminoles looked to have a formidable 1-2 punch at the front of the weekend rotation in junior Drew Parrish and sophomore C.J. Van Eyk, but beyond that, there were only a few arms such as Chase Haney, Clayton Kwiatkowski and Jonah Scolaro who had been relied upon in key situations. Parrish and Van Eyk haven’t had the seasons that either would have hoped for while Scolaro, a Freshman All-American last season, has had some control issues out of the pen. In 2019 however, sophomore Conor Grady and J.C. Flowers, a junior everyday player in the outfield, seem to have become the most reliable arms for Florida State and of late, have rejuvenated the staff. Grady was named the ACC Pitcher of the Week on Monday for FSU. In contests against Florida and more recently, Clemson, Grady worked a total of 12.1 innings while allowing just three hits, no earned runs and striking out 20 batters. Grady leads the Seminoles this season with 16 appearances — all but two out of the bullpen — and owns a 6-3 record with a 2.41 ERA. Among qualified players, Grady ranks in the top five statistically in the ACC in each of those areas. After allowing just a hit and an earned run in a no-decision against Florida last week in a 3-1 loss, Grady helped FSU complete the sweep of Clemson on Sunday. Grady was able to strand only one of the two runners inherited in the third inning of a 4-3 game, but kept the Tigers off the board for the next five-plus innings, allowing just a hit while fanning 11. Going back to March 20, the Seminoles have won eight games. Grady has been the winning pitcher in four of them. Over that span, Grady has worked 19.1 innings while boasting a 1.41 ERA, just 10 hits allowed, two walks and 28 strikeouts. The other pleasant surprise for Florida State on the mound has been the junior Flowers. Coming out of high school, it was known that Flowers could be an option for Mike Martin and company on the mound, but until this season, he was not used in that capacity. At the plate, Flowers is in the midst of shattering previous career-highs for home runs and RBIs, but he’s been arguably better as the closer. As of Monday, Flowers ranked in the top 15 nationally with eight saves. In 15 innings of work this season, Flowers has yielded just a single earned run on nine hits while striking out 16 batters. While Grady has earned wins in four of FSU’s last eight victories, Flowers has saved seven of the last 10 wins for the Seminoles. Among ACC relievers, only Clemson’s Carson Spiers has more saves with nine. 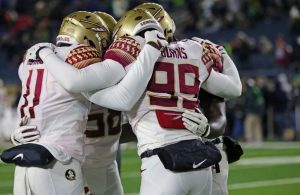 The good news for Florida State is that while Grady and Flowers have kept the FSU staff afloat, the top part of the rotation seems to be coming around. For the season, FSU’s 4.56 team ERA ranks just 10th in the ACC, but the Seminoles haven’t allowed more than five runs in any of their last six games and are yielding just 3.3 runs per contest over that span. In Friday’s 6-2 win over Clemson, Parrish had arguably his best outing of the season — or at least since getting the start in the Opening Day no-hitter — when he yielded just three hits and one walk in eight shutouts innings while striking out 12. The very next day, Van Eyk allowed just two runs on four hits in eight innings of work while walking one on an economical 100 pitches. 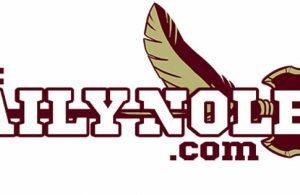 Since a lengthy slump following a 12-0 start, the Seminoles have now won four of five with all four wins coming against teams currently ranked in the D1Baseball.com Poll. 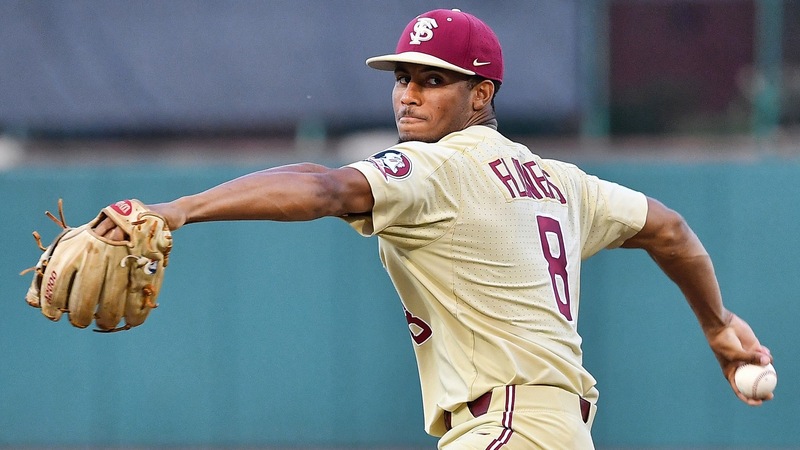 Grady and Flowers’ performances from the mound have been a big reason for that as FSU has temporarily weathered what could have been a significant storm. The next three weekend series for FSU will come against teams that currently do not own a winning ACC record. The Seminoles will need to take advantage of that to extend their streak of making the NCAA Tournament to 42 years. It may need to do so just to make the ACC Tournament.